View resource availability for this resource, including different unit availability at different time periods. 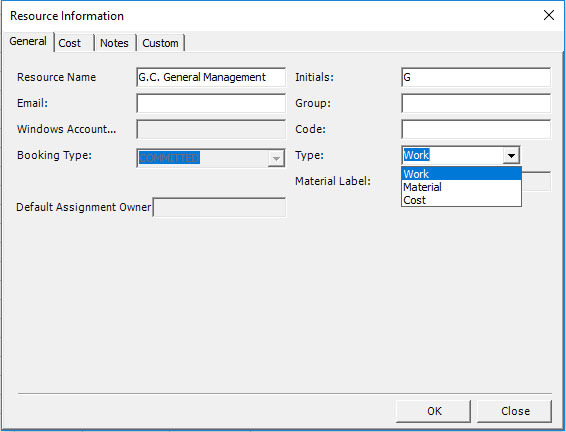 View how much of the resource is available for assigned work, for example, part-time or multiples. View the initials, group, or code for this resource. View whether a resource is a generic resource or an actual resource. View whether a resource is active or inactive. 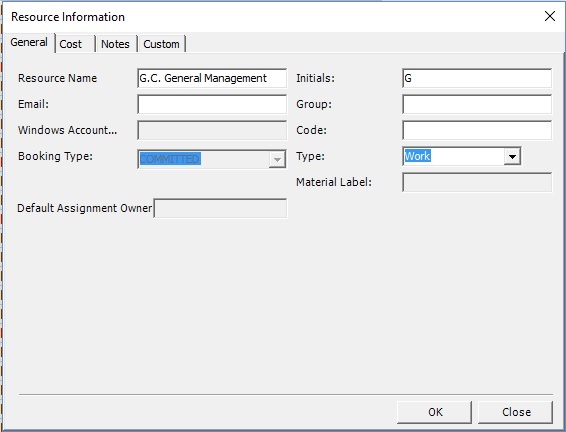 In Planner application use the Resource Information dialog box to enter, review, or change basic information about the selected resource. In any resource view (Resource Sheet, Resource Usage, or Resource Graph), click the resource, and then click Resource Information. Resource name Shows the name of the selected resource. Initials Shows the resource's initials or other abbreviation that identifies the resource. In some views you can use this abbreviation in place of the resource's name to save space. Group Specifies the group to which the resource belongs. If you enter a group name, you can sort resources by group or apply a filter to show information about specific groups. Code Specifies a code for the resource, such as a cost center code. Details Opens a dialog box from your e-mail address book showing information about the selected resource. Type Specifies whether the resource is a work resource, a material resource or a cost resource. Work Work resources are people, equipment, or facilities that are assigned to a task and are not consumed during the task. Material Material resources are consumable resources, such as steel, that you want to track. Material label Specifies the label for the unit of a material resource. For example, for cement, you can enter Yard, to track yards of cement for the project. This box is available only if the Type box is set to Material. Cost Cost resources are defined as resources that let you apply a cost to a task by assigning a cost item (like a capital expenditure on equipment, or variable costs such as airfare or lodging) to that task” to indicate that there are also supported resources of type cost. The following are details about options for electronic collaboration with resources. Email Specifies the resource's e-mail address. Workgroup Specifies how the resource receives messages for team collaboration. Proposed Specifies that the addition of this resource is considered tentative. Committed Specifies that the addition of this resource is considered definite. This is the default booking type. Generic Specifies that the resource is an account of skills required for a task, rather than an actual resource. Inactive Indicates whether the resource has been deleted or otherwise removed from the resource pool. For example, you might want to remove a resource from the list of enterprise resources before you move a resource from one department to another to keep the resource's work for the two departments separate. Use this table to view a resource's start and finish date on the project. You can also view in this table differing levels of maximum units availability at different times during the project. These settings, together with the resource's calendar, determine how much work a resource can do without being overallocated. Available From Resource's start date for the current level of maximum unit availability. Available To Resource's finish date for the current level of maximum unit availability. Units Type the number of maximum units available for this resource during the period of time specified in the Available From and Available To fields. A collection of information about a resource's rates, including the standard rate, overtime rate, any per-use cost, and the date when the pay rate takes effect. Notes - displays the notes related to a task, if any.